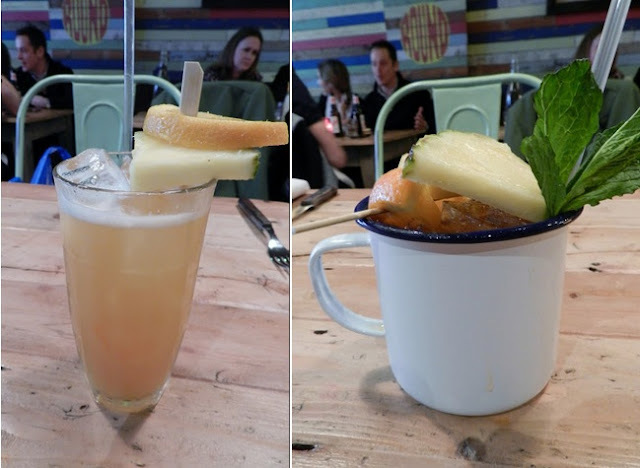 after meandering around portobello road market yesterday, we worked up a bit of an appetite so decided to check out the Rum Kitchen, a Caribbean themed offering tucked just behind the market road. it's a laided-back, fun, young place where they play reggae in the background as tables of people drink rum-cocktails and chow down on some great food. we got there just before 4pm which meant we were there just before the brunch menu finished - i was hoping to try their chicken wings and salt fish but sadly they don't serve those till later in the evening - which simply means i'll have to visit again! i opted for a mug of the rattle skull punch which was a delicious blend of white and dark rums with lashings of fresh juice and spices while the girls tried the Rubin Carter. all three of us ordered a pulled pork sandwich which was a delicious - served in a thick brioche bun, the pork has a nice melt-in-the-mouth texture but i thought it was lacking a nice sauce to go with it so i ordered some mind-blowing 'swamp' hot sauce to drizzle on top - perfect! you can find the Rum Kitchen located at 6-8 All Saints Road, W11 - make sure you head down for a visit!